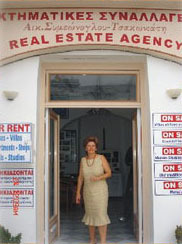 Welcome to the oldest real estate office that exists on the island of Naxos. Having vast experience, we can help you complete your buying and selling always in a responsible way. Our continuous and reliable presence in the real estate business, counts an outstanding number of satisfied clients, something that guarantees your own, future, buying and selling. Our Services: Newly Built Houses, Old Traditional Houses, Seaside Tourist Areas, Villas, Apartments - Hotels, Commercial Properties, Shops, Plots, Rentings.